In a world where there is a notion that “money buys you happiness”, therefore working in the financial advisor profession would equally make you happy and inspire you to take action to meet and exceed your goals, one has to ask “WHY” these survey results are happening. 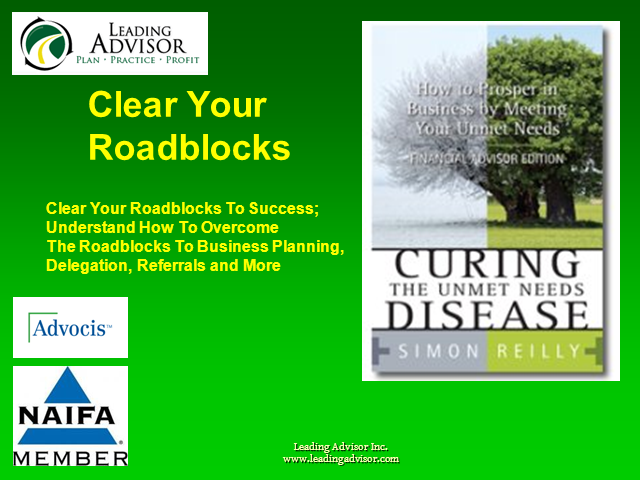 Simon Reilly, Leading Advisor Inc.
Are you successful, with 10 years of experience or more, yet consumed with the cumulative demands of clients, sales and personnel? Are you challenged by market-driven changes in profitability, niche marketing and service requirements? … which means that you are working long hours, have no time to relax, and are disillusioned by business systems that are not working and by a lack of enthusiasm for your business. We offer the Clear * Plan * Practice™ Coaching Program for financial and investment advisors that has been proven to clear the roadblocks that are holding most financial and investment advisors back. Presented by: Simon Reilly, Leading Advisor Inc.